New Delhi: NRDC-Amity Innovation Facilitation Centre organized a day long Workshop on “Innovation and Intellectual Property Rights” for the students, faculty members and researchers at Amity Campus, Sector-125, Noida. Dr. H. Purushotham, Chairman and Managing Director, NRDC, Shri B.C. Tripathi, CMD , Gail India Ltd; Dr. K.S. 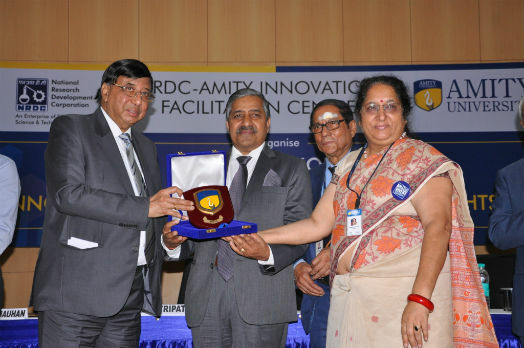 Kardam, Sr. Joint Controller of Patents & Designs Technical Head, Delhi Office, Indian Patent Office; Ms. Pooja Chauhan- Vice Chairperson, Amity Humanity Foundation and Dr. Ashok K Chauhan- Founder President, Amity Group inaugurated the Workshop. Sharing his views, Dr. Ashok K Chauhan- Founder President, Amity Group stated that Amity, right from inception, focusses on new, innovative and creative ideas and encourages students and faculty members to ideate and innovate to become successful and wealthy in their lives. He shared that Amity has filed over 870 patents in last few years and soon, the maximum number of patents will be filed by Amity across India. Addressing the gathering, the Chief Guest- Shri B.C. Tripathi, CMD, Gail India Ltd stated that IPR is a global need; with every passing decade the rate of change is becoming faster in the world and Innovation can pre-empt the changes and drive the well- being of the society. He stressed that Innovation is at the core of the development of human beings and human society and the need of the hour are creativity, innovation and patenting. In Global Innovation Index (GII), India’s position is at 60 whereas US and China have been filling 25-30 times more patents. He remarked that there is big concern about falling economic growth and job growth which, he opined, can be resolved through Innovation in terms of manufacturing, frugal engineering and reverse Innovation. He stressed that any conduct in business whether it’s Innovation, needs to have transparency, otherwise acceptance will not come from society. He opined that it is important to create awareness about IPR amongst the youth and motivate them to come up with inclusive, transparent and affordable innovations which are beneficial for larger part of society. He called upon the youth to challenge them and embark upon the road of entrepreneurship and innovation. Dr. H. Purushotham, Chairman and Managing Director, NRDC encouraged the youth to give a thought to entrepreneurship and come out from the college with innovative startup ideas. He apprised them to protect their knowledge and ideas while they are doing their research with IP Protection, without which the knowledge is not counted in the market. He stressed that IPR is the key for prosperity; through IPR knowledge can be transformed into a venture, which will generate wealth and that wealth needs to be ploughed back for the creation of knowledge. Expressing his views, Dr. K.S. Kardam, Sr. Joint Controller of Patents & Designs Technical Head, Delhi Office, Indian Patent Office stated that the future of IPR is bright in the country and youth of the country is bound to take it to greater heights. He shared that India is amongst top 15 countries of the world filing highest number of patents and Indian Patent Office is a member of World Intellectual property Organisation (WIPO) and functions as International Searching Authority, which is a matter of great pride. He shared that the Government is also giving further focus on IPR through various policies and schemes such as National Idea Policy 2016 and Felicitation schemes for startups for protecting their ideas. He highlighted that most probably by next year, WITO would approve fee concessions for patents filed by Universities which will encourage the patent filing culture in the Universities of India. He called upon the students to file patents under International Patent Systems to protect their inventions globally especially where markets for their inventions exist. The inauguration was followed by two technical sessions-“Innovation and IPR” and “IP Monetization and Management System” by eminent speakers including Dr. Jyoti Yadav, Head, Planning, Monitoring and Evaluation, CSIR-IGIB, New Delhi; Dr. Rajesh Dixit, Dy. Controller, IPO, New Delhi , Dr. Bijaya Kumar Sahu, NRDC, New Delhi and others.